Fiore Stone, Inc., the manufacturer of Al's Garden Art, offers a one year manufacturers warranty facilitated by the dealer. Replacements and/or warranty orders are placed with authorized retailers. In all cases we require pictures or inspection of the item(s) to identify the item/color and to ensure the products is determined defective under the limited warranty policy. Warranty items are offered F.O.B. from the factory in Corona, California. Freight charges are covered only when the replacement(s) are shipped via company trucks on a routine delivery our store. Generally, Fiore Stone ships qualified orders in about 4 to 6 weeks. FOUNTAIN PLACEMENT A fountain assembly sheet, fittings as well as tubing are included for each fountain type. Contact your dealer if you did not receive all necessary pieces. Copies of assembly sheet are available under assembly instructions. All fountains can have some amount of over splash regardless of style or design. Placement location of any fountain is the sole responsibility and liability of the purchaser. Al's Garden Art produces two types of fountains: Pedestal and Basin styles and each have their own installation requirements. PEDESTAL TYPE FOUNTAINS should be placed on a solid surface like concrete, brick pavers or an optional matching fountain skirt. Most pedestals are hollow inside and rain and/or sprinklers may erode the soil underneath, jeopardizing the fountain's stability. BASIN FOUNTAINS - must be placed on a soft surface like sand or gravel. If a basin type fountain is to be installed on a hard surface like concrete or tile, a 1" to 1½" layer of sand must be applied over the surface. This will help with leveling by allowing the basin to settle and be completely supported, reducing the risk of possible stress fractures caused by the added weight of water and fountain components inside the basin. This sand should be grouted after the installation. Basins come in various sizes and shapes. Most basins have a 1" coupling (or hole) near the center that a rubber grommet fits in. The pump's power cord runs through this, and out beneath the basin. Placing a sweep of minimum 1½" conduit or PVC underneath the basin from the center out to the edge or to the power source is a smart consideration. This will prevent major dismantling should the pump need to be replaced. Please consult an electrician regarding local code requirements. 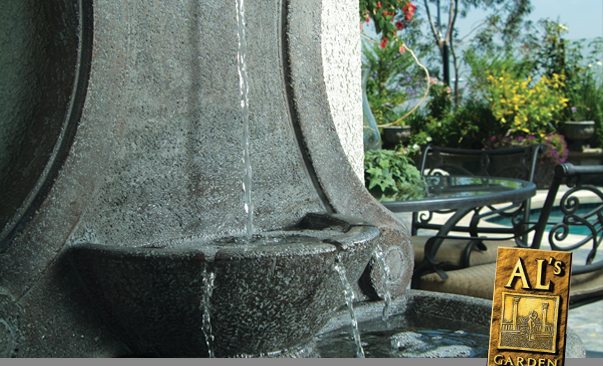 PEDESTAL STYLE FOUNTAINS - Place pedestal/base style fountains on a firm, level foundation. If the fountain or statue is to be placed on dirt, a 24" concrete stepping stone is recommended to avoid erosion. Most pedestals are hollow inside and splash, rain and/or sprinklers may wash away dirt and cause your fountain or statue to tumble. WALL FOUNTAINS - can be configured as either pedestal or basin style fountains. All wall fountains must have a solid wall support such as a brick or stucco wall with studs (drywall or plywood will not provide adequate support). All wall fountains are recommended to be secured with a brackets to mount top components firmly to a wall structure. Generally wall fountains allow for the power cord to escape from behind between the wall and the fountain. Small hanging-style wall fountains need to be mounted using proper heavy duty attachments for the structure to which they are being mounted. Consult your local hardware store regarding hardware, weight of the item and your wall material. Keep fountain bowls filled to proper level to maintain proper operation of the submersible pump. It is not recommended that fountains be left running during the night or when not at home as the water level cannot be monitored. NEVER LET THE FOUNTAIN RUN DRY!!! Lack of water will burn out the pump. The rule of thumb is that if a fountain runs for eight hours at a time you are bound to have to add more water to it. Check for leaks. First fill your fountain to the brim. Do not operate the fountain. If your fountain is leaking, the water level in the fountain will be lower and the ground around the fountain will be wet. Before you perform this test, you should turn off any sprinklers around the fountain as not to confuse the area's wetness. If no moisture, do you have pets? You could very well be loosing water due to thirsty pets. 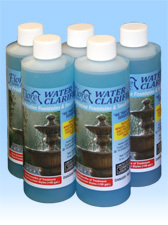 Clean with a soft cloth and treat water seriously and preserve your fountain finish with Fiore Stone Water Clarifier. All water contains minerals which will remain whenever water evaporates, Also known as mineral deposits, these elements, over time, develop a white sheen covering the original finish. Do not use any abrasive that can damage the applied finish. To prevent mineral buildup, we highly recommend Fiore Stone Water Clarifier (AG-60). Only a few drops per gallon of AG-60 Fiore Stone Water Clarifier every two to three weeks will prevent most fountain finished discoloration while also maintaining crystal clear water. NEVER USE HARSH CHEMICALS! Bleach, chlorine or other harsh chemicals will break down limestone carbonite, the chemical process that binds cement and can severely damage the surface of the concrete typically around areas of moving water and the underside of bowls. READ ALL INFORMATION supplied with your pump regarding its proper care and cleaning. Always plug the pump into a properly grounded junction box with a GFI receptacle. PROTECT FROM FREEZING. It is best to store concrete items indoors. DO NOT allow water to collect and freeze in the bowls. Cracking will occur. Small hairline surface stress cracks are common to all concrete products due to the natural weathering and outdoor temperature changes. There are no manufacturer warranties against that occurrence. Q. Do I need a water supply for the fountain? Q. Does the pump use a lot of electricity? Q. Can I order this fountain in a different color? Q. Do I need to use chemicals to treat the water? Q. Can pieces be ordered individually should a component need replacement? Q. Can the design of a fountain be changed? Q. Can my fountain withstand freezing temperatures? Q. Why should I purchase a fountain from Al's Garden Art? A. No - the fountain is self-contained and the water is circulated by a submersible pump. A. No - about the same as a light bulb. A. Yes - most dealers can accommodate special orders. Speak with the store manager about lead-times. Al's ships qualified orders within 3 to 4 weeks. A. Yes - Clean water is obviously the best way to maintain a beautiful water feature. Recommended are product such as Fountec to prevent algae growth and Protec to prevent the buildup of mineral deposits often found in hard water. Never use bleach! A. Yes - Your Al's Garden Art dealer can specify each component of any fountain. Each component piece is identified in our dealer catalog and weights and measurements are available. A. Components can be configured to alter the fountain style. However, because all pieces are cast from molds individual designs can not be altered. A. Yes - Al's Garden Art offers a one year limited warranty on all concrete and pump products. Inquire with your dealer if the pump offered is supplied by Al's Garden Art. Some dealers carry their own line of pumps. A. Yes, as long as it is dry. Fountains need to be emptied and covered with plastic or a waterproof tarp to prevent freezing and possible pitting of the surface caused by standing water. A. Al's Garden Art is a third-generation family owned business that has been making concrete fountains and statuary for over 50 years. Is there enough water in the fountain? Many require a full water level to operate properly. Is the plastic tubing kinked, blocking the water flow? Did the circuit breaker go off? Is there debris, leaves, mineral buildup, etc. blocking the intake to the pump? Is there an "airlock" in the pump? Plug and unplug the pump several times to clear it or pour water into the tubing. Is the propeller in the pump turning? Consult manufacturer's directions for servicing supplied with the pump. Check for leaks by filling the fountain without operating the pump. If you do not see water around the base, it might be splash out on a windy day or a thirsty pet! In some cases water clings to lips or spillways, causing water to fall erratically. Applying a small amount of clear silicone at those points where water is designed to fall could help water release from the lip in a continuous pour and reducing splash. Simply place a small amount of silicone on your finger and lightly apply by pulling down, creating an up-side-down teardrop for water to follow. A fountain assembly sheet, fittings as well as tubing are included for each fountain type. Contact your dealer if you did not receive all necessary pieces. In order to identify which assembly sheet is appropriate for a specific fountain it is best to locate the item through the product search feature. Installation sheets are based on the overall design style of a fountain. Al's Garden Art supplies dealers with pumps and accessories as an option. Some dealers may purchase accessories in bulk from third party suppliers. Best would be to speak with the person in charge of ordering fountains and statuary regarding availability and ordering schedules. Authorized Al's Garden Art dealers can order replacement parts, pumps and accessories and arrange shipment via our truck, regular mail as well as UPS. In many cases dealers would simply extend the cost of shipping and handling and reserve the option to ship these items direct to your home. Whenever possible your local dealer is the best source for information regarding fountains and statuary. Al's Garden Art does provide direct customer support and we are committed to provide you with the best customer experience. Please refer to the Contact Us page for the appropriate contact information.